CMRL at Johns Hopkins University is involved in a large and diverse computational research program, with significant national and international recognition. It focusses on Computational Mechanics that develops computational methodologies to characterize, predict and simulate physical events. 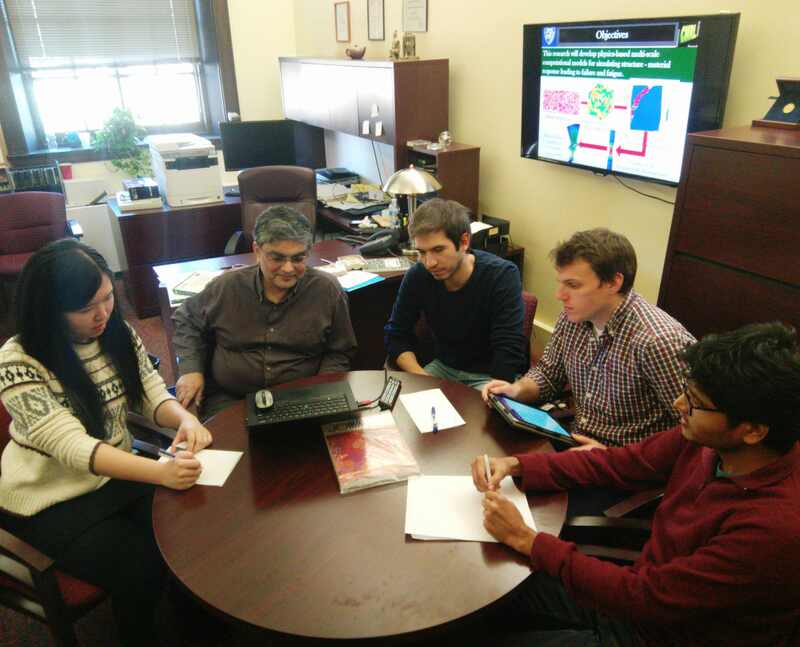 CMRL is making pioneering contributions to the field of multiple-scale modeling of behavior of materials and manufacturing among other fields. Concurrent multiscale models coupling atomistic and continuum models are useful for extending the spatial limitations of atomistic models, as well as for deriving effective continuum models. This work is developing new class of fracture mechanics models from concurrent atomistic-continuum computational models with an embedded crack in the atomistic domain. We are developing Parametrically Homogenization based Continuum Damage Model (PHCDM) models for composite structures (plies, laminates) of polymer matrix composites from micromechanical models of fibers and matrices in the microstructure. In this example damage of laminated composite starts with the saturation of transverse crack and is relayed by the catastrophic development of delamination. A computational framework is developed for multiscale modeling of fatigue in Ti alloys for aerospace structures using Parametrically Homogenized Constitutive Models (PHCM) and Parametrically Homogenized Crack Nucleation Models (PHCNM). PHCM and PHCNM development from micromechanical analysis with Machine Learning. A Phase-Field model is coupled with crystal plasticity finite element models (CPFEM) to model crack propagation in polycrystalline materials. The 3D microstructure of a Ni-based superalloy is experimentally capture, and virtual microstructures are generated to probe the role of morphological and spatial statistics on deformation and failure. A multiscale crystal plasticity finite element model is developed to understand crack nucleation under fatigue and its fundamental link to the microstructure at different length scales. We are developing multiphysics computational models for multifunctional applications like sensors and antenna. (Right) Simulation of the evolution of time-dependent electromagnetic fields due to alternating current in a monopole antenna structure undergoing transverse vibrations and (Left) Simulation of an embedded damage sensor for structural components. We at CMRL have made pioneering contributions to the field of multiple-scale modeling of behavior and failure of heterogeneous materials and manufacturing processes. This work encompasses several length scales, viz. nano-, micro and macro-scale that are characteristic of different engineering systems. Chartered in July 2013, The Center for Integrated Structure-Material Modeling & Simulation (CISMMS) creates a collaborative, multidisciplinary research and educational program to foster foundational advances in computational modeling, simulation and design in the fields of Integrated Computational Materials Science and Engineering (ICMSE) , Multi-Scale Analysis (MSA) and Computational Structure-Material Analysis and Design (CSMAD). 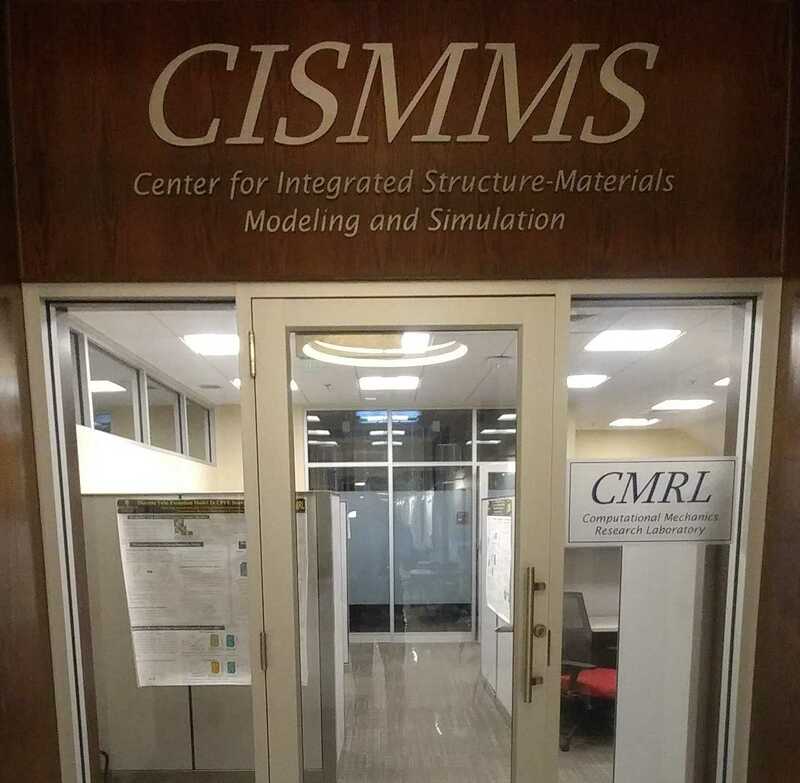 CISMMS creates three dimensional and computerized models and simulations to study and improve the design of materials ranging from automobiles and air craft to biomaterials and electronics.